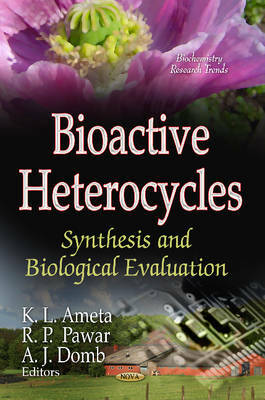 This book is a critical and lucid account of various synthetic methodologies and biological activities of different sized bioactive heterocyclic compounds. In effect, this book imparts a great deal of comprehensive reviews about the chemistry and biology of selected groups of heterocycles and natural products including important pharmaceuticals as well as agrochemical pesticides in one handy project. Besides, this compendious effort encompasses different methods of synthesis and biological evaluation of heterocyclic compounds. The main purpose of this book is to share the recent advances and scope of Bioactive Heterocycles for the future avenues in the field. It has specifically been designed by keeping in mind the wide interests of individuals engaged in the design and synthesis of biologically active heterocyclic compounds as well as research scientists in academia and industry. The authors expect this book to be a standard reference in Universities and industrial libraries.